It is now possible to add Google Doc links to Multi-Student files and individual student Files & Folders. 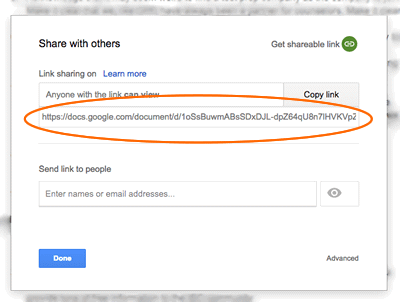 For information on how your students can add Google Doc links, see "How do my students add Google Doc links?" 4. The document will then appear within the folder and clicking on it will launch the Google Doc in a new window. 1. Click the 'Share' button in the upper right-hand corner when viewing your Google Doc. 2. Copy the link in the input box. Tip: Be sure the visibility settings are set so anyone may view the Google Doc. 1. Navigate to the student's profile page and click on "Add Files & Folders"
2. Follow steps 2-4 from above, and you're all set!